Al replied ‘Hell no she’s not cute. But you’ll have a good time with her’ and we’ve had a good time ever since. We dated 5 years and it was dating, nothing more. I told him I either want to get married or I was going to visit my sister in Seattle where she had plans for me. She was probably going to introduce me to someone to marry because she was an orthodox jew. She was going to be a Yenta. In the spring, I told him I was leaving shortly for Seattle, Washington. He said he was coming to Kansas City that night to see me, and he took the next train out from Witchita, Kansas where he lived at the time. He said he didn’t want to lose me and let’s get married. 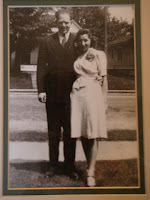 We married June 15, 1941 in the synagogue. It was a Jewish custom back then to borrow a ring for the marriage because no one had any money to buy a ring. I was married with my mother-in-laws ring. Joe bought it from her for, I think, $1. My mother-in-law made supper for us after the wedding for just the family. We honeymooned at Excelsior Springs in North Kansas City (45 minutes away from the house). We borrowed my father-in-laws car as we didn’t have one. I was 25, Joe was 24. Joe’s folks didn’t want him to get married as he would be marrying before his older sisters and, in those days, that was a no-no. An interesting side line of the story is that my Uncle Al, who introduced them, moved to California while my folks settled in DC. Traveling back and forth across the country just didn’t happen back in those days so my folks and Uncle Al didn’t see each other until the folks flew to California on the way to Hawaii to celebrate their 25th anniversary. My parents enjoyed 65 and 1/2 years of the most wonderful marriage I’ve ever seen or heard of. 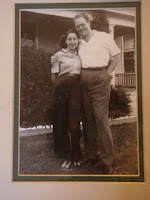 They were (and still are) ‘Gertie and Joe.’ Although Dad is now physically gone, they are still one entity. I remember one time, I was visiting them in Arizona, lying in the back bedroom about to go to bed. Dad was watching the news on the big tv in the living room, Mom went into their bedroom to watch another channel. I heard Dad turn off his tv and go into the bedroom. Then, I heard the sound of – what’s this? – arguing! I thought ‘Hot diggity! A heated argument! Better listen in!’ I hardly ever heard them bicker. This ‘argument’ though was amazing to hear. Dad had turned off the tv in the living room and gone into the bedroom where Mom switched channels to what he had been watching. He was arguing with her about her turning the channel to what he wanted to see! He said that she should watch what she wanted. She said she didn’t care - they’d watch what he wanted. They were arguing about who was the less selfish. That was the story of their life – he thought about her first and foremost, and, in turn, she thought about him first and foremost. That was one secret to their 65 1/2 year happy marriage. Their love was based on respect, honor, and gratitude that they had each other in their lives. Dad had bypass surgery when he was 65. The doctors estimated his life span at another 10 years. He lived another very full 24 years, and I have no doubt at all that he lived those years due to the love he shared with my darling mother. Wow! Another favorite on my 'how we first met list'. Thanks for posting! I never heard the story on how Bubbie and Zaidie met. Very interesting! Even more interesting that they dated for 5 years, just dated "nothing more"! Come on Bubbie.... you can pull one over on Aunt Lori but not me! LOL! You're a pretty good writer, you know. Whatever happened to that little book I saw once of the history of their marriage (think it went with the cool custom "family history" painting)?